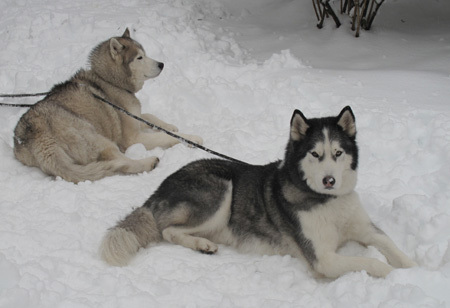 Now that I’m working from home full-time, I’m with my two Siberian Huskies a whole lot more. Whether they (and I) enjoy this is another story. Huskies are stubborn dogs and want what they want. They’re not sleeping at my feet or fetching things for me throughout the day. They’re not looking for extra love and attention. They keep to themselves, for the most part, and hang out around the house. Kona, my oldest, is usually hairing up the rug in my office, while Kailua is usually lounging outside. I love my dogs, but they can get demanding throughout the day. If they could talk, I’m pretty sure our conversations would go something like this. Me (in the kitchen making coffee in the morning, feeling Kona’s stare): Kona, I’m sorry to disappoint you, but you’re not getting any other food. Kona (nosing his all natural, expensive food we buy him due to his allergies): This is gross. I want steak. Or cheese. Me: Eat your food before your brother eats it for you. Kona (eating a few bits, spitting some out on the floor, gagging just a little bit, walking away): You clearly hate me. Kailua (sidling in and eating Kona’s food): I could use another bowl of food! Me (in the office now and after hearing the sound of empty metal dog bowls being moved around by Kona): Should’ve eaten when you had the chance, Kona! Kona (from the kitchen): Screw it. Let me outside with my brother. 30 minutes later. Howling commences. It sounds like a pack of wolves are in my backyard. This often happens while I’m on a conference call. Me (running across the house to get to the back door, swinging back door open): Would it kill you to bark? Kona: I’m caught around the tree. Me: Again Kona? It’s not like we just planted that tree. You know it’s there. Kona: I’m stuck! Get me back inside! I put shoes on and retrieve Kona from around the tree. 25 minutes later. Kailua starts incessantly barking his deep, loud bark. Me (from the porch): What? Kailua (from the middle of the yard): Hi Mom. I’m bored. Me (after asking if Kona wants to join his brother in the below freezing weather): It’s cold out here. I’m going back inside. Doesn’t look like Kona wants to come outside. Sorry. Kailua: It’s beautiful. You don’t know what you’re missing. Kona: I want to go outside now. Me (now nice and settled back in the office): You couldn’t go out 10 minutes ago when we were at the door? I let Kona out. Kailua now wants to come back in. Me: Wait. Didn’t you just want someone to join you outside? Kailua (staring at the couch and waiting for me to go back into the office): But now I want to lay on the couch. Me: Don’t get on that couch. Kailua: Don’t you have work to do? This is about how it goes on those more demanding days. You know that once I get back into the office and start working again, Kona starts howling to get back in the house. Kailua gets yelled at to get off the couch, as I put shoes on to retrieve Kona from around the tree again and, once inside, Kona starts nosing at his replenished food bowl. There’s a cycle. And as annoying as it can be, I wouldn’t change it for the world. I know. As annoying as it can be, I wouldn’t want it any other way. They’re both getting older, and I can’t imagine them not being around! Hilarious! I’m not so sure I want to try and put my dog’s actions and expressions into words – I think I’d either die laughing or of embarrassment (i.e. – aren’t German Shepherds supposed to be smart??). She’s a good egg, just a bit out there. I know I’ve told you this already, but your dogs are gorgeous!! Thanks, Cynthia! I always love reading your posts about wolves. I feel like I’m reading about my dogs’ ancestors! Glad you enjoyed it Katherine! Believe me, it could have been a super long post with all the stuff we “talk” about every day. They’re high maintenance but I love them. Thanks for stopping by! anotherjennifer recently posted..Advisors, Consultants and Counselors, Oh My! Jen, loved this post, and now that I am a mom to a 10 month black Lab…I can understand completely what you mean. Dogs speak with their eyes, there is a secret language that only the owner and his/her dog can comprehend.